NOW that you own a Victrola the whole world of music is open to you. There is no kind of music that you may not hear, at will, for the greatest artists in the world record for the Victrola. Everything is yours from the magnificent pageantry of the grand opera to the wild swing of the dance. The opera, the oratorio, the gospel hymn, the musical farce, the popular song, the war song, the military march, the symphony - these come to you in your own home. There is no variety of personal taste and no condition of mind, to which the Victor records will not minister. The instrument itself will not require any great or expert care. It is carefully constructed, and before leaving the factory, it is subjected to the most rigorous tests. The directions in this book, however, should be read and the book itself preserved, in order that you may become familiar with every part of it. To obtain the best results, and the unique quality that goes only with Victor products, you should use only Victor records and the Victrola Tung-stone styli, or Victor steel needles. Behind the scenes at the opera; in the console of the pipe organ and in the studio of the master are mechanisms essential to the production of the pageantry; the music or the painting. In the Victrola, likewise, is a mechanism of reproduction - concealed, silent and dependable. To you, as a Victrola owner, an exact scientific knowledge is not necessary. 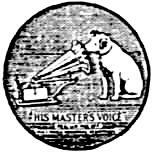 A general understanding may increase your appreciation and enable you to observe the simple rules for keeping your Victrola in the perfect tune in which it was received. 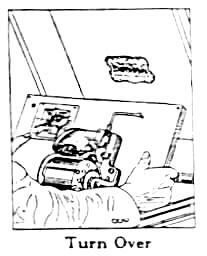 (1) - Unfasten the taper tube by removing the brace from the end of the sound box crook. 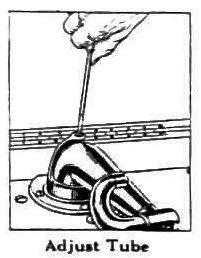 (2) - Swing the taper tube gently back and forth, between its stop limits. It should move freely without friction or binding, so that the needle will be permitted to pass easily over the record. Next see that the tube does not rattle on its bearings. (3) - If the taper tube is too tight, or too loose, proper adjustment can be made after loosening the lock nut and turning set screw, in the top of taper tube support, to the right or left. Turning the set screw to the right tightens the taper tube; to the left loosens the taper tube. After the proper adjustment has been secured, tighten the lock nut. Note - On instruments where the lock nut is not used proper adjustment can be made after loosening the set screw holding the pivot in the taper tube support. 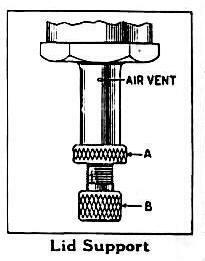 Pressing the pivot into the taper tube tightens the tube; drawing it out loosens the tube. After proper pivot setting has been secured, tighten the set screw. (Style 50 Portable Instrument). Loosen (but do not remove) the three set screws in the taper tube support to the right or left until the adjustment is right, then tighten the set screws. right far enough to clear the turntable. 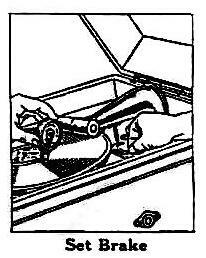 Pull the brake lever toward the front of the cabinet. (5) - The turntable may now be mounted on the spindle. 1st - Swing the taper tube to the right as far as possible, and then holding the turntable in both hands drop it over the spindle. 2nd - See that slot in the turntable hub drops over the pin in the spindle. (6) - Next mount the sound box on the sound box crook. The small projection on the inside of the sound box is slipped into the slot in the sound box crook, and is then turned to the right as far as possible, to lock it in place. The stylus, or needle should rest at an angle of about 60° to the surface of the record. (7) - The winding key may be next inserted in the opening at the right in the cabinet, and the motor wound by turning the key clockwise. A drop of oil should be placed on the escutcheon before inserting the key. wind the spring too tightly. 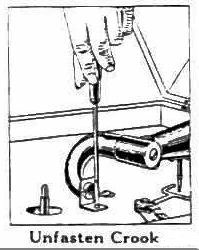 Start the motor by pulling the brake lever towards the front of the cabinet. (9) - Wind the motor and let it run down two or three times to assure free working of all parts and re-distribution of lubricant. The turntable should revolve at 78 revolutions per minute, by the speed indicator. 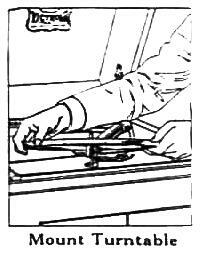 The speed of revolution may be checked by placing a piece of white paper under the edge of the record on the turntable, and while the sound box and needle are in playing position, note the number of revolutions per minute. The speed regulating screw may be set to give the proper speed. then carefully move the hand to the right or left until it points to 78 on the dial. 1st - If the lid closes with a bump loosen lock nut "A," and turn the adjusting screw "B" to the right until proper cushioning has been secured. Then tighten the lock nut. If, after making the adjustment, the lid fails to operate properly, place a few drops of oil (preferably Neat's-foot) in the top of lid support tube. turning the adjusting screw to the left. Your Victrola is now ready to play. (1) - Put the Victrola Tungs-tone stylus, or a new Victor steel needle in the sound box needle arm as far as it will go and tighten the needle screw firmly. Place the record on the turntable. 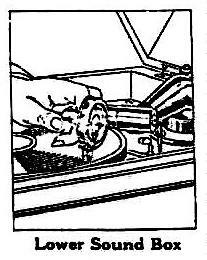 (2) - Swing the taper tube toward the center of the record as far as it will go, and then swing it out far enough to put the stylus or needle on the inner spiral or playing groove on the record. 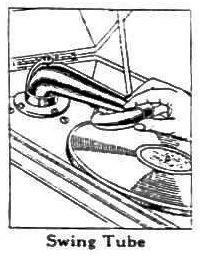 Note - When playing a record having an eccentric groove, place the point of the stylus or needle in the eccentric groove, at the number pressed on the record. Holding the sound box in this position, take hold of the automatic brake knob and swing it towards the front of the cabinet until its arm is brought against the trip rod on the taper tube. 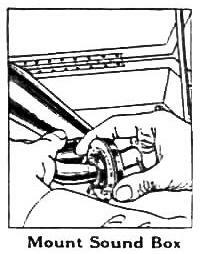 (3) - Now start the motor by bringing the brake lever towards the front of the cabinet. 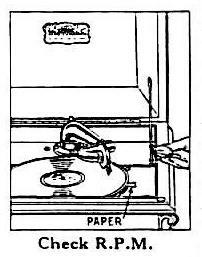 (4) - After the turntable has revolved several times, and picked up speed, lower the sound box gently on the smooth outside rim of the revolving record. Then carefully push the needle into the sound wave groove. 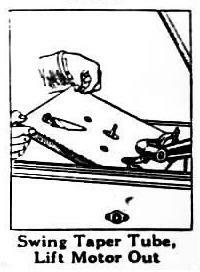 (5) - When it is not desired to use the automatic brake feature, it may be made inoperative after swinging the taper tube to the right as far as possible and then swinging the automatic brake knob in to the left until it just clears the turntable. 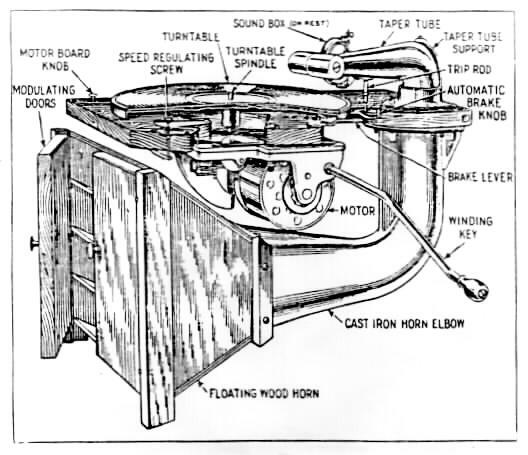 The brake lever may then be used to start and stop the Victrola at will. Your Victrola will require but little care mechanically. A little lubrication here and there is all that is required; and this attention is only necessary at infrequent intervals. 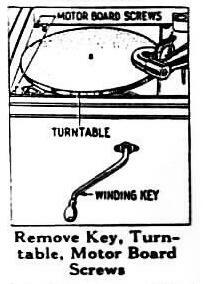 (1) - Remove (a) the winding key; (b) turntable; and (c) the motor board screws. (2) - Next swing the taper tube to the right as far as possible, pull the brake arm to the left until it clears the back edge of the motor board, then grasp the knob on the front and lift out the motor board. 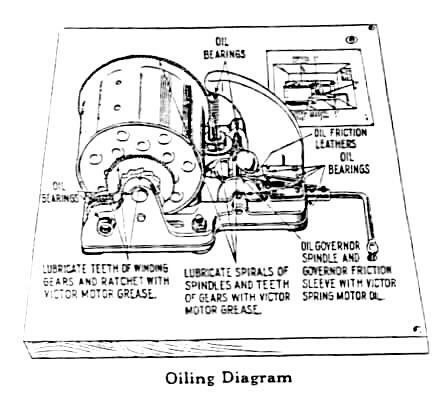 (3) - Turn the motor over to permit ready inspection and lubrication. Note - Should it at any time be necessary to remove the motor from the motor board, be sure to first remove the indicator hand. To do this, slide the dust cap to one side, remove the dial cover and crystal, unscrew the small nut on the shaft, then lift the spring washer and hand from the shaft. clean cloth dampened with a little kerosene. The proper lubricant required for your Victrola can be secured from any dealer in Victor products, and only Victor products are recommended. 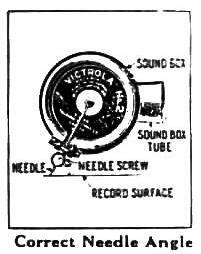 (1) - A loose needle is a frequent cause of a noisy sound box, hence if your Victrola reproduces improperly see that the needle is securely fastened in its holder. (2) - If you are using steel needles, put in a new needle after every record. Using a steel needle more than once injures the record. The Tungs-tone stylus can be used until the reproduction becomes imperfect. The stylus can be removed from the sound box and re-inserted as desired. With care it should play from 100 to 300 records. (3) - If a sound box noise should develop and if tightening or changing the needle does not eliminate it, and if the noise persists with various records, it is possible that the sound box is injured, or out of adjustment. Take the sound box to a dealer in Victor products for repair. 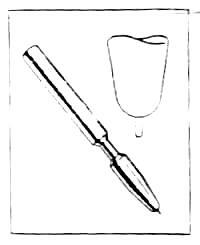 (1) - Do not poke at the mica diaphragm with your finger or with a sharp implement. It is tough and durable, but may be injured through abuse. 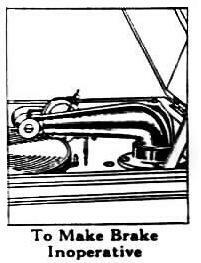 (2) - Do not leave the sound box down on the turntable when your Victrola is not in use. Turn it back onto the sound box rest. (3) - Do not drop the sound box onto the record. When starting to play, lower the sound box gently. The records should be kept as free from dust as possible. Gritty dust on the records not only wears out the record rapidly, but causes harsh and unpleasant reproduction. Before playing, it is advisable to brush off the records. A piece of velvet or plush glued to a wooden block forms an excellent record brush. The records should be kept in the envelopes in which they are received, or in record albums provided for the purpose. The paper separators prevent any possibility of injury by contact between the records. It is also inadvisable to stack the records up, one on top of the other without any regard to the sizes. Records should be assorted as to size to be readily accessible. The records should not be exposed to severe heat, and should be cleaned only by brushing with the velvet or plush pad as noted. Soap and water or any other cleaning compound should not be used. If a record becomes cracked or badly scratched it is best to completely destroy it. Playing a scratched or imperfect record may result in injury to the sound box. while other points have been made imitating the general form of tungs-tone styli, they are invariably of some other material. The Tungs-tone stylus, because of its soft texture will not wear out your records. And it does not have to be changed for each record. 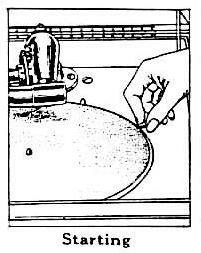 Instead of being tapered the Tungs-tone stylus is cylindrical inn shape, and of the same width as the record groove. As its tip wears down, the stylus will not, therefore, like a tapered point, tend to crowd the sides of the record groove and thus impair the tone of the music. Its diameter remains the same from first to last. Each Tungs-tone stylus should play from 100 to 300 records. It is desirable to occasionally give the stylus a partial turn in the needle arm. For perfect reproduction and maximum record life we recommend that you use none other than the Victrola Tungs-tone stylus or the Victor steel needle. 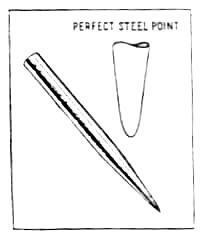 A new steel needle should be used for each record, as a steel point wears down during the playing. 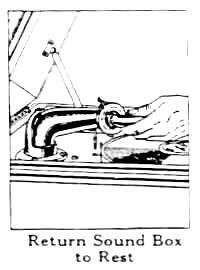 If any part of your Victrola cannot be placed in perfect condition after following the instructions given in this book, consult a dealer in Victor products. 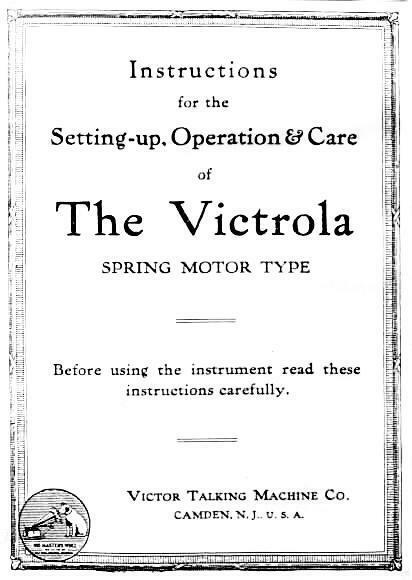 When returning any part of your Victrola to a dealer in Victor products for repair, give the type and serial number of the instrument as found on the name plate, and the motor number stamped on the small plate on the motor frame. This website's intention is solely for educational and personal entertainment use only.Though no copyright appears on the original document it would probably be a Bad Idea to reproduce it commercially without first getting permission from RCA Victor. For accurate reproduction I suggest using Netscape and setting the width of your browser window so that the horizontal scroll bar just barely disappears. I also suggest that you use a serif font like Times or Charter; they're both fairly close to the original font (21 point Bitstream Charter looks best on my 1152x900 Linux system). To see the original pages, have a look here (~210Kb).